It was Nobita's birthday and Nobita wanted to justify that his parents gave him birth and didn't adopted him. So he uses Time Machine to go back to past on day of his birth with doraemon. They see that Nobita's dad going hospital and they follows him and reaches hospital. They waits outside his mom' room. Later Nobita goes inside the room and see himself as a baby boy. But Nobita tells that the baby's face look like a monkey and says all weakness about himself. His parents get angry and send him outside. Their parents imagined that Nobita will be Very strong in everything. 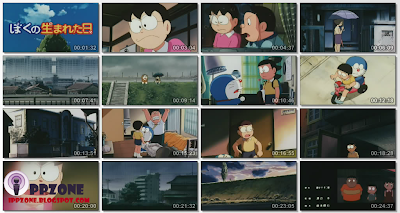 But these proves to be mostly wrong except one thing that Nobita is light hearted and has a best friend Shizuka, who always help him in almost everything. Then his parents keep him a name Nobi Nobita - which means to be a good person. Hearing these, both Nobita and Doraemon breaks down to tears. Nobita comes to his house in Time Machine and immediately starts to Study his lessons, seeing Nobita's parents were so happy. Later in night, Nobita's best friend Shizuka and his other two friends Gian and Suneo , all came with their Birth day gifts. They all celebrate his Birthday. In one of Nobita's birthday episodes, it was suggested, that Nobita holds Shizuka's hand and both goes to goes to hangout together at the end of the episode. Coming Soon On This Week... Stay Tooned !